Plant phytolith and water content cause differing degrees of tooth enamel abrasion in vertebrates. This is the conclusion reached by an international research team headed by scientists from Johannes Gutenberg University Mainz (JGU). Their study, featured online before print in the journal PNAS, has implications for how tooth wear in extinct animals is interpreted and how this information can be employed to reconstruct their dietary behavior and habitats. In their study, the researchers were able to demonstrate that tooth enamel is abraded more rapidly when plants with a higher phytolith content, such as grass, are consumed rather than those with a low phytolith content, such as alfalfa. Phytoliths are microscopic mineral inclusions made of silica dioxide that are present in many plants. Although phytoliths are softer than tooth enamel, scientists have been uncertain whether tooth abrasion is mainly caused by phytoliths within the plants or mineral particles and sand adhering to the surface of of the plants. To evaluate the abrasive effect of phytoliths, six groups of guinea pigs in the University of Zurich’s Clinic for Zoo Animals, Exotic Pets and Wildlife were fed for three weeks with three different fresh or dried plants (alfalfa, grass, and bamboo). The plants fed to the guinea pigs had varying levels of phytolith content, ranging from 0.5 to 3 percent, but were otherwise free of any adhering particles. 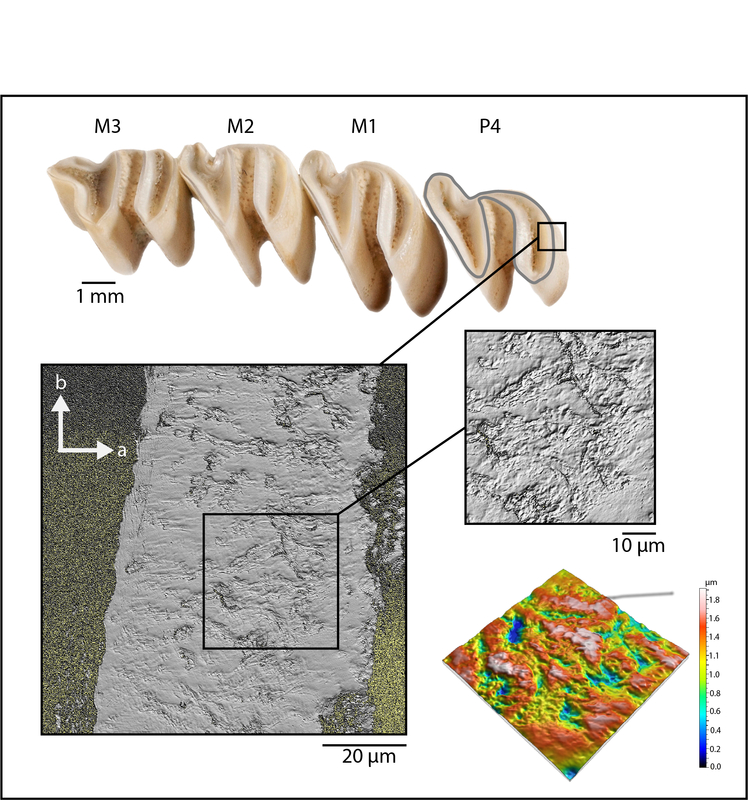 The surface topography of the enamel of the guinea pigs‘ molars was then examined using high-resolution microscopy. This revealed that abrasion was more extensive with increasing phytolith content of the feed. In addition, it was also observed that the water content of the plants plays a role. In the study, the researchers systematically analyzed the abrasive properties of fresh and dry plants with different phytolith contents. They determined that dry feed results in greater tooth wear than the equivalent fresh feed. „The enamel of the guinea pigs we had fed on dry grass was much more worn and rougher than the enamel of the animals that had been given fresh, and therefore moister, grass,“ said Dr. Daniela Winkler, head of the study at the Institute of Geosciences at JGU. Remarkably, however, there were no differences in tooth surface texture in the case of guinea pigs that had eaten fresh or dried alfalfa and those that had eaten fresh grass. „While there is a similarly low level of wear following consumption of alfalfa and damp grass, the landscapes in which alfalfa or grass grow can differ greatly,“ Winkler pointed out. „This may indicate a potential source of error in how paleontologists have been using tooth abrasion to reconstruct herbivore diets and habitats,“ said Winkler. „We often try to deduce what the habitats of the corresponding animals were like by analyzing the abrasion of their fossilized teeth. Less abrasion, for instance, indicates that the animal might have lived in a wooded landscape with lots of herbage and foliage, rather than in a steppe-like environment dominated by grasses. Furthermore, the surface textures of teeth of fresh grass grazers may resemble those of leaf eaters. We need to bear these findings in mind when reconstructing the diet of extinct animals on the basis of their fossil teeth,“ concluded Winkler. Involved in the study were scientists from JGU, the University of Zurich’s Clinic for Zoo Animals, Exotic Pets and Wildlife, the University of Hamburg’s Center of Natural History, Ghent University, and the Max Planck Institute for Evolutionary Anthropology in Leipzig. The study was undertaken as part of the Vertebrate Herbivory research project of Professor Thomas Tütken of the JGU Institute of Geosciences, which is funded by a Consolidator Grant provided by the European Research Council (ERC).